Finally, the days are getting longer and the nights warmer – perfect conditions for lighting a fire for a braai. 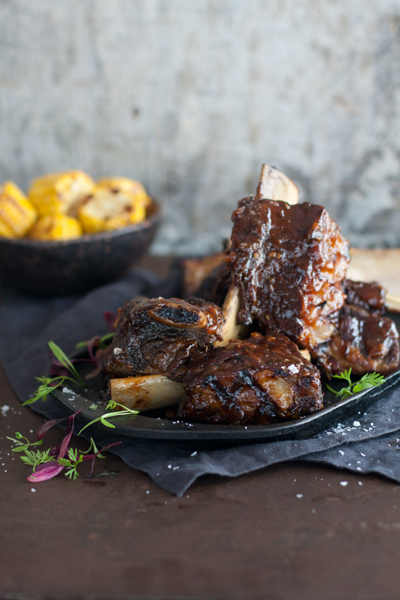 If you need some braai recipe inspiration we’ve rounded up some. These tasty ribs will take you back to the days where you lounged around the pool on the hot summer days! In a medium size saucepan over a medium heat, fry the onions in the knob of butter until they soften and begin to colour. Add the garlic and ginger and fry for another minute. Add the rest of the ingredients and stir well to combine. Bring the saucepan to the boil then turn down the heat and simmer for 20 minutes until the marinade thickens. Heat the oil in a large frying pan over a high heat. Sear the beef, two pieces at a time, until you have a seared crust on all sides. This step is crucial for flavour so don’t rush it! Take your time and sear the meat as you would a steak. The better the crust the better the flavour. Place the garlic and thyme into a large roasting tray and arrange the ribs on top. Add the stock until the ribs are almost half covered. Seal tightly with heavy duty foil and braise in the oven for 2 hours. At the 2 hour mark, check the ribs and if they are not fork tender then braise for a further 30-45 mins.